Earlier on Saturday, a number of donors received awards at the Saturday luncheon. ABI Executive Director Samuel J. Gerdano was recognized for achieving the Lifetime Member level. 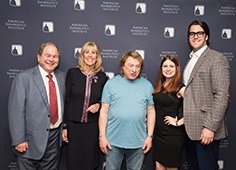 Pictured below are other honorees: Michael DuFrayne (far left) and Robert D. Katz (center), both from Executive Sounding Board Associates LLC, Jeffrey N. Pomerantz (second from left, from Pachulski Stang Ziehl & Jones LLP), and Rita Kostopoulos from Kostopoulos & Associates PLLC. 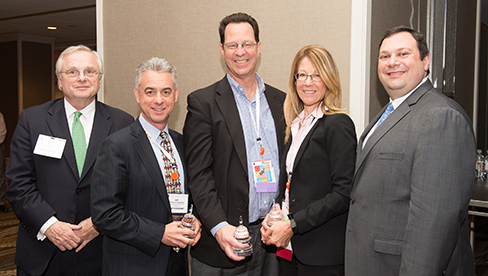 All received Benefactor Awards from ABI’s Vice President – Development Ted Gavin (Gavin/Solmonese), pictured at right. Other honorees included Mark G. Stingley (Bryan Cave LLP) at the Visionary level, as well as Mark E. Felger (Cozen O’Connor), and Monique J. Mulcare (Mayer Brown LLP), at the Sustaining Member level. You can see the full list of recent donors below, as well as information about how you can continue to support the Endowment. ABI is grateful to all of its generous donors! 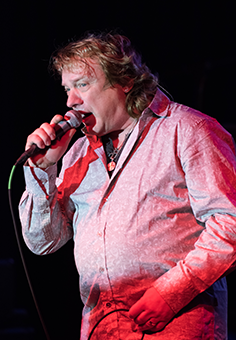 Lou Gramm entertained a packed Final Night Gala with Foreigner classics. At the Endowment Reception, Gramm posed with, from left, Southeast Endowment Chair Jerry Markowitz, Past ABI President Trish Redmond, and third-year law students Amanda Parra Criste and her husband John Criste (University of Miami School of Law). May 4: The Endowment will pair up with the Steven M. Yoder Children’s Trust to host a golf tournament. Come out to support two charitable causes at Hartefeld National Golf Club in Avondale, Pa., which is convenient to both Wilmington and Philadelphia. Cocktails, a silent auction and dinner will be held following golf. May 13: Come on out and join the musicians of Bankrupt Talent for a benefit concert performance from 7:00-9:30 p.m. at the legendary Le Poisson Rouge on Wednesday, May 13, 2015, the night before ABI’s New York City Bankruptcy Conference on May 14. Bankrupt Talent—an annual rock ’n roll tradition led by musical host Randa Karambelas—brings together performers from the insolvency community each year to raise money for worthy charities. Plenty of networking space, conversation-friendly volume and a roomy bar and seating area make for the perfect combination of business and pleasure. This year’s concert will support the National Pancreatic Cancer Foundation and the Chordoma Foundation, as well ABI’s Anthony H.N. Schnelling Endowment Fund. 100% of all ticket sales and corporate donations will go directly to these charities. ToneyKorf Partners, LLC is this year’s primary sponsor, with additional support coming from Akin Gump Strauss Hauer & Feld LLP, EisnerAmper LLP and Polsinelli. Tickets for this event are $40 in advance and $55 at the door for attendees; $100 for performers. Corporate donations can also be made at $100, $500 and $1,000* levels. *Corporate donors at the $1,000 level will receive two tickets to the concert and have their logos featured on the event page. Current sponsors include ASK LLP, Bryan Cave, Dykema, Freeborn & Peters LLP, Gavin/Solmonese, Greenberg Traurig, and Shaw Fishman Glantz & Towbin LLC. Firm sponsorship, which includes a listing of the firm’s logo plus a table of 8, is $1,500. Individual tickets are $200. Contact ABI Events Marketing Specialist Sharisa Sloan (ssloan@abi.org, 703-739-0800) for more information about Coprporate Donations and Sponsorship Opportunities at any of these events. ABI thanks these latest major donors, whose names are among a special group dedicated to advancing research of interest to the bankruptcy community. You can donate silent auction items — a great way to support the Endowment! Don’t know what to donate? Possible items have been selected and are available for purchase at Amazon.com under a special ABI Wish List. Pick out items now for the silent auction that will be held at the upcoming Winter Leadership Conference, and be sure to place your own bids at the conference. ABI’s Anthony H.N. Schnelling Fund will be providing the financial support for a national empirical study of individual chapter 11 cases. The $83,000 study, announced at the Annual Spring Meeting last week, will be conducted by Prof. Margaret Howard (Washington & Lee University School of Law; Lexington, Va.). She is the Law Alumni Association Professor of Law at W&L and one of the nation’s leading bankruptcy academics. Prof. Howard is a former member of the ABI Board of Directors and a past ABI Resident Scholar. The principal investigator on the study is Prof. Richard M. Hynes, the Nicholas E. Chimicles Research Professor of Business Law and Regulation at the University of Virginia School of Law. He also serves as director the John M. Olin Program in Law and Economics. Profs. Howard and Hynes will build on their pilot study, completed in 2014, which identified the key demographics of filers and catalogued the most common reasons for filing. New empirical data will inform questions such as the costs to parties, returns to creditors, better case-management practices by the courts, adequate creditor participation and success measurements. The final product is expected in 2016, and should provide important insights into how to modernize individual chapter 11 practice. R. Scott Williams – Rumberger, Kirk & Caldwell, P.A.